Twenty years ago this month I began my stint as my alter ego: The Recordist. June 2018 marks the 20th anniversary of The Recordist and the website that I created. When I started the website, online sound effects distribution was in its infancy. There were a handful of sites with individual sounds available and the coding was tedious and tough. I was offering custom sound effects (by mail on CD) to people who contacted me through the website but I was mostly just giving sounds away. It would take 10 years (2008) before the tech was readily available to distribute my sounds on the internet. On March 16, 2018 I had the chance to use the new Rycote Stereo Cyclone Kit 5 for the Schoeps CMC MS microphone setup. 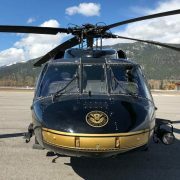 This was the first time I had it outside in very windy conditions (from the UH-60 Blackhawk blades) I have to say I’m very impressed with the way the Cyclone handled the heavy wind as the helicopter started up and turned away. 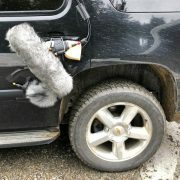 Lately I’ve seen many requests on social media for car tire noise on dirt and pavement so I rigged up a down and dirty AT-835ST and MKH8040 microphone combination to my Tahoe SUV and went for a drive. As the sun came up and melted the roads I drove around some more on slightly wet dirt roads… with puddles. In December 2017 I spent a day recording bullet ricochet sounds using various suppressed rifles and calibers. One of the rifle platforms stood out… The 300 Blackout. The subsonic 7.62x35mm projectile is 4 times as heavy as a .223 round and travels at +/- 1020 feet per second. 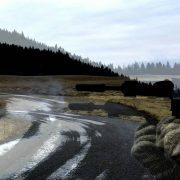 I was able to place a a Sennheiser MKH8040-ST XY stereo microphone 150 yards downrange and have my armourer carefully shoot bullets near the microphone. The idea was to have the projectiles hit the frozen ground just before and beyond the microphone. Some projectiles hit the soft frozen dirt while others bounced off rough gravel. 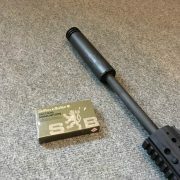 Recorded a suppressed 300 Blackout rifle using Sellier & Bellot Tactical ammunition. This is the first time I’ve used this ammo and I am very happy with the “quiet” results when using a suppressor. This was just a quick test with my Sennheiser MKH8040ST XY microphone rig. First, I stood a meter away from the microphone and recorded multiple shots. I then moved back a couple of meters and faced the microphone in another direction and recorded more.